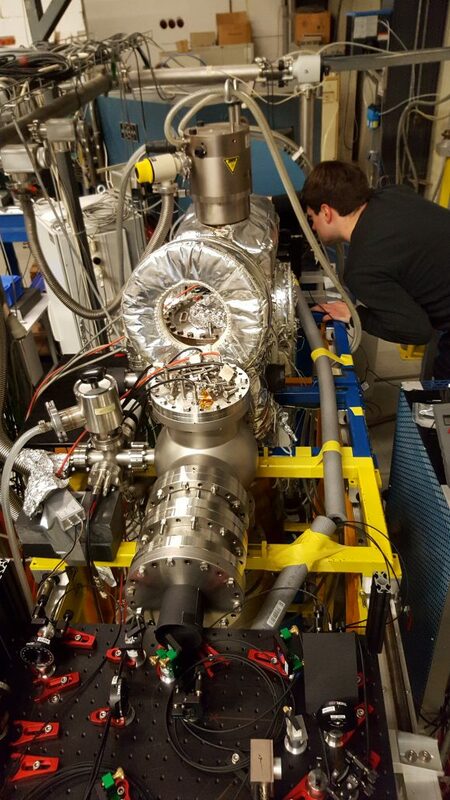 In a joint experiment of the LMU group and the PTB group a first run of laser spectroscopy experiments has been done on trapped Th-229 from the Munich recoil ion catcher, with laser systems and optical detection methods developed at PTB. The measurements should provide crucial information on the nuclear properties of the isomeric state from the hyperfine structure of electronic transitions. The first experimental campaign in October/November this year has proven the joint working of the systems and has yielded first spectra. A detailed data analysis requires more reference spectra from ground state Th-229 to be measured at PTB. PTB researcher Johannes Thielking working on the experiment at LMU Munich.